When you become a member of LYWA for a one-time donation of US$1,000, you can enjoy all the amazing benefits that membership brings, including access to the entire LYWA library in digital format. A free copy of each free book published by LYWA in the future. A free copy of each Lama Yeshe or Lama Zopa Rinpoche book edited by the Archive and published by LYWA or Wisdom Publications for sale in the future. Any of our DVDs in stock sent to you for free by request. 50% discount on Adele Hulse’s Big Love, the official biography of Lama Yeshe, to be published by LYWA. One year subscription to FPMT’s bi-annual Mandala magazine, including a PDF of the magazine and the Mandala ebook. Light offerings on the four great Buddhist festival days over one year in Bodhgaya. Access to the entire LYWA library of books and DVDs in digital format in our Members Area. Books will be available to members in pdf and ePublishing formats. Access to selected print quality images of Lama Thubten Yeshe and Kyabje Lama Zopa Rinpoche, which may be downloaded for personal use. You can read more about our Membership program here. 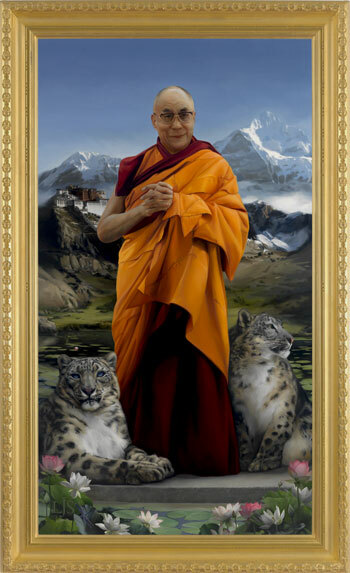 Those who can offer US$1,500 or more will receive all the benefits above, PLUS a limited edition of Lisa Sawlit's spectacular portrait of His Holiness the Dalai Lama. The limited edition prints are 36” x 22” (91.5 x 56 cm) in size, and have been numbered, signed and sealed by the artist. Become a Benefactor of the Lama Yeshe Wisdom Archive and play a role in bringing the essential teachings of Lama Yeshe and Lama Zopa Rinpoche to people all over the world. 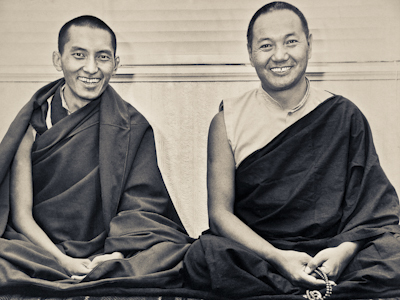 Your donation will help the Archive to continue in our work of preserving, editing and publishing the teachings of Lama Yeshe and Lama Zopa Rinpoche, and other great teachers of our time. For your donation of $100 or more, we will send you any LYWA publication, in print, ebook or DVD. All donors of $50 or more will receive a print copy of one of our free books, or any one of our ebooks. Members and those who have donated US$250 or more to LYWA can select one of the following FPMT practice booklets for download as a free pdf file. Members and those who have donated US$500 or more to LYWA can also select one of the following FPMT online courses for free download. The Lama Yeshe Wisdom Archive is a 501(c)(3) tax-deductible, non-profit corporation dedicated to the welfare of all sentient beings and is totally dependent upon your donations for its continued existence. The Archive was established with virtually no seed funding and has developed solely through the kindness of our many supporters. Our further development similarly depends upon the generosity of those who see the benefit and necessity of this work, and we are so grateful to all our contributors, large and small, who make the work of the Archive possible.